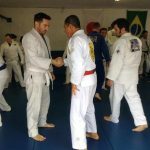 Victor first came to the United States in 1996 to compete in the Pan Ams for Team Gracie Humaita. He returned to the States several times to compete and then settled in Jacksonville over a decade ago. He’s proud to call Jacksonville home.